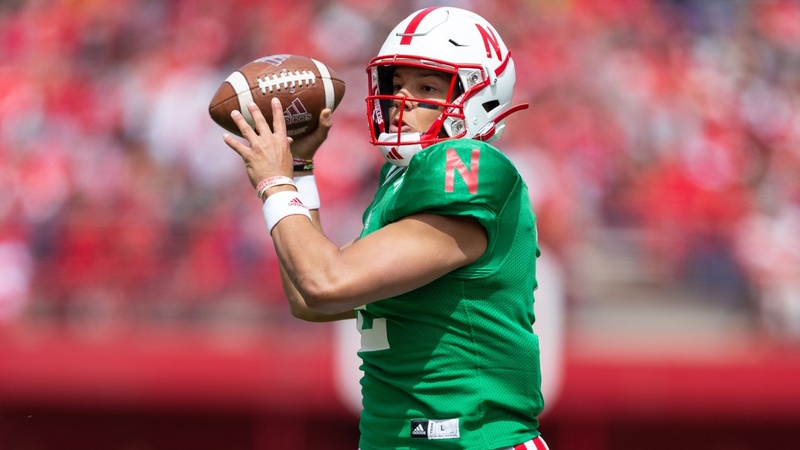 Adrian Martinez did not play very long in Saturday’s Red-White Spring Game — he played through the first quarter and took one snap in the second — but he still flashed plenty of the talent that made him a freshman All-American last season. He saved his best play for last. The Play of the Game for the 2019 Spring Game — as determined by you, the people, with 58 percent of the vote — is Martinez’s 21-yard touchdown pass to Jaron Woodyard. A false start and a 2-yard run at the end of the first quarter gave the Red team a second-and-13 to start the second. Martinez faked the handoff to the running back then dropped back as he surveyed the field. Redshirt freshman outside linebacker David Alston came off the edge unblocked, though a tight end releasing from the backfield caused him to hesitate for just a second before continuing his rush. With Alston bearing down on him, Martinez made a move and got past him — though Alston thought he got enough of a hand on the green-clad quarterback for the sack — and rolled out toward the sideline. Martinez took a couple of strides then loaded up and launched from just outside the 25-yard line, hitting senior Jaron Woodyard on the H in the corner of the end zone. Senior cornerback Avery Anderson got there just as the ball hit Woodyard’s hands and delivered a hard enough hit to carry him out of bounds, but Woodyard hung on for the Red’s second touchdown of the game. The extra point made it 14-3 in favor of the Red team. After that play, Martinez took a seat and let redshirt sophomore Noah Vedral take over. Martinez finished 5-of-9 for 110 yards and a touchdown with six carries for 11 yards and another score. Martinez didn’t do much on the ground on Saturday, but on that touchdown pass, he showed how special his legs can be whether it’s avoiding the rush in the backfield or escaping the pocket and getting upfield. The throw on the run was pretty solid as well and proved to be the only passing touchdown of the day for the Red team. Woodyard — one of the players looking to garner a larger role heading into his senior season — made a great play to get open for his quarterback and complete the catch through contact. It was Woodyard’s only catch of the day, but he made it count. The Red Team went on to win 24-13 in a defensive battle, but that play showed Nebraska’s offensive potential with Martinez at quarterback. That’s why Adrian Martinez’s 21-yard touchdown to Jaron Woodyard is the Play of the Game for the 2019 Red-White Spring Game.